This may be the world's smallest steam iron with a mighty ability to set crisp creases and remove wrinkles. It is strong enough for everyday use at home, yet lightweight and compact for taking along with you. When trying to iron in and around pockets and pleats, the SteamFast SF-717 with its tiny non-stick soleplate, will get into places bigger irons can't reach. 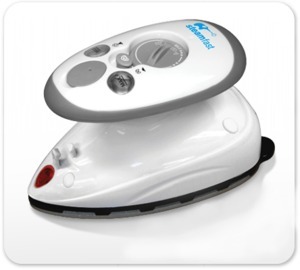 If you travel, or if you simply need to touch up garments away from home, the SF-717 Steam Iron is an ideal appliance. It comes with a convenient travel bag, and features a non-stick soleplate, and dual voltage for overseas travel. Your college kids away from home will love its portability and ease of use. You can be confident that Steamfast products are built to perform, and are built to last.